Grace is using Smore newsletters to spread the word online. “Kaboom!” exploded Mount Vesuvius. Lava came spewing out of the volcano. Burning Pompeii and Herculaneum, 2 cities in Rome, Italy. That is what this paper is about, Pompeii. In this article you will learn about the Pompeii disaster, the unfortunate people, and super cool facts. In A.D. 79 Mt Vesuvius buried Roman cities Pompeii—and many of its citizens, beneath tons of volcanic ash and debris.Mount Vesuvius erupted destroying Pompeii shortly after noon on the 24th of August. "Darkness fell, not the dark of a moonless or cloudy night, but as if the lamp had been put out in a dark room." Wrote Pliny the Younger, who witnessed the cataclysm from across the Bay of Naples. Since Pompeii has been rediscovered in the mid-18th century that part of Rome has seen a lot of treasure hunters and archaeologists and still after hundreds of years about one third of the city still burned. The people of Pompeii had no time to even breathe, there was nothing they could do, they couldn't run away. In a blink of an eye there is lava coming down from Mount Vesuvius burning several villages.Not all people got hit with lava, this is very gruesome but ,10% of the people they have discovered so far have been impaled on rocks and other sharp things and the other 90% burned to death in lava. They died from being flash heated, what happened was the people were cocooned in lava which was drying and all the ash that was coming down got caught in that lava. It is said that a prisoner survived Pompeii because back then they had singles sell prisons with thick concrete walls so thick that lava could not penetrate it but the heat made it trout to the point of being burned really badly. Pompeii was not discovered until around 1779 , when workers stumbled upon it while building King Charles III Palace. Before the eruption of 79 AD there was not even a word for Volcano, which was created afterwards. 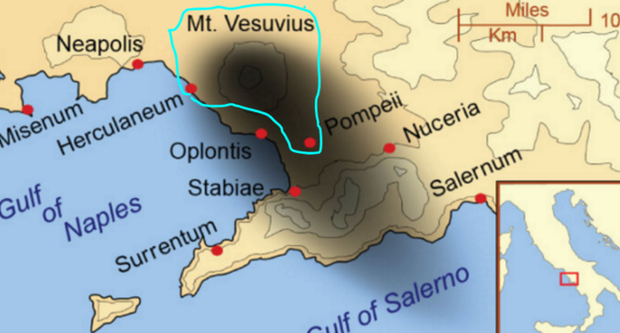 Volcano derives from the word Vulcan - the Roman God of the Flame and Metal Forgery. Hundreds of lives taken. The catastrophic event had a big impact in the Tourists in Italy. Just imagine the suffering the people of Pompeii and Herculaneum went through. Who says history will not repeat itself we just need to know when. A.D- confusingly for a Latin phrase: anno domini (“in the year of the Lord”—the year Jesus was born). penetrate- succeed in forcing a way into or through (a thing).